Canadians are obsessed with beauty. And with the span of this great country – from the magnificent Mount Saint Elias to the edge-of-the-Earth Cape Spear, from the painterly Cape Columbia to the unsuspicious Middle Island riddled with gangster history – our expectations for living somewhere beautiful is set high. 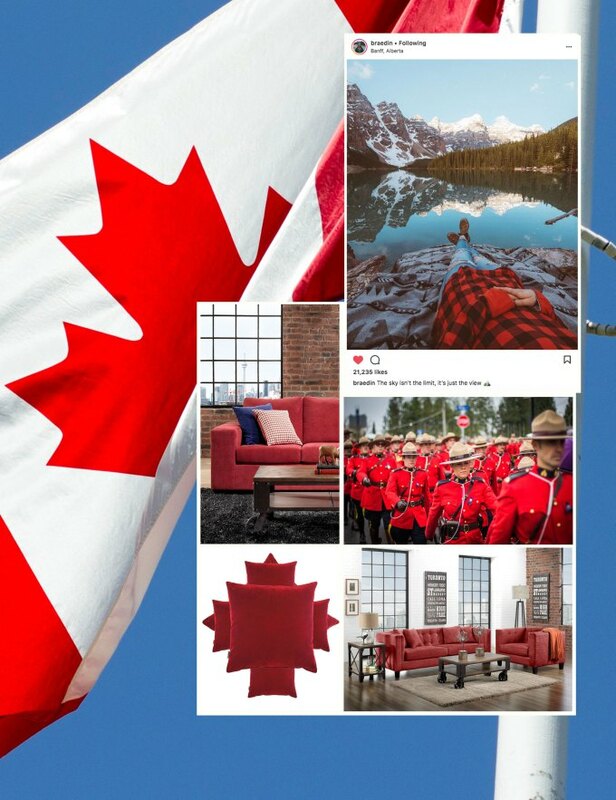 So a red and white Canada mood board just makes sense, especially when we’re celebrating Canada Day. Immediately, to start creating a Canada mood board, you’s think red and white. And that colour combination definitely works together. The a good sofa reads comfort, but red – from light to deeper shades – makes a bigger statement about the home’s personality. It symbolizes nobility and power, but it’s also known to invigorate mood. White, of course, represents purity. And while colour is an obvious way to create a Canada mood board, there are other things to contemplate. Custom colours are one way to personalize your home, exactly how you want it. Not only do these companies employ Canadians, they also source materials, such as lumber, steel, foam and other raw materials, right here in Canada. It’s nice to know that getting Canadiana inspired does’t have to be superficial. It can be as deep as our Great Lakes and as gorgeous as our natural resources. Not sure where to start with colour? This will help. Is your mattress screwing with your metabolism? Find out here. One of these seven reasons is why you just had the worst sleep ever.